A roller coaster at Six Flags Great Adventure in Jackson, N.J.
Sunday is National Roller Coaster Day. From their humble wooden beginning, roller coasters have evolved into some of the biggest attractions at theme parks. Now you can soar higher, twist and loop faster and even enjoy the whole experience backward. From the traditional wooden to the indoor to the high-speed coaster, satisfy your inner thrill-seeker with these area roller coasters. The wooden roller coaster is the classic scream machine. Hellcat, Clementon Park's wooden roller coaster in Camden County, features a 110-foot plummet, "a stomach-swirling helix, and zero-gravity thrills." Wildwood visitors know that The Great White at Morey's Adventure Pier is a must. The ride begins with an exhilarating 25-foot drop into a dark tunnel before reaching speeds of more than 50 miles per hour after its 105-foot second drop. At a 76-degree angle, El Toro at Six Flags Great Adventure in Jackson, Ocean County, has the steepest drop of any wooden-style roller coaster in the country. Hersheypark and Dorney Park in Allentown are other spots to enjoy a good wooden coaster. Part of the excitement of a roller coaster is the loop -- that feeling you get when you're briefly hanging upside-down. The SooperDooperLooper at Hersheypark is the first looping roller coaster on the East Coast. The Ring of Fire at Clementon Park is a 60-foot loop thriller that even comes to an upside-down standstill. You can also check out the Looping Star at Keansburg Amusement Park in Monmouth County. What's more kid-friendly than Storybook Land in Egg Harbor Township, Atlantic County? Bubbles the Coaster is a perfect introduction to coasters for the kiddos. The little ones might also enjoy the Dragon Coaster at Bowcraft Amusement Park in Scotch Plains or the Joust Family Coaster at Dutch Wonderland in Lancaster. And, of course, you can't forget Sesame Place in Langhorne. What's more fun than riding a roller coaster? Riding it backward. Possessed at Dorney Park twists riders 360 degrees as they ascend 185 feet up one end of the massive structure then rise at a 90-degree angle in reverse at the opposite end. The Sidewinder at Hersheypark is a steel roller coaster that takes riders forward and backward in an exciting "boomerang" style. For a limited time, Six Flags is offering an all-new experience for its BATMAN coaster by running the inverted steel coaster backward. When it comes to coasters, for some people, faster is better. If you have a need for speed, look no further than Kingda Ka at Six Flags. 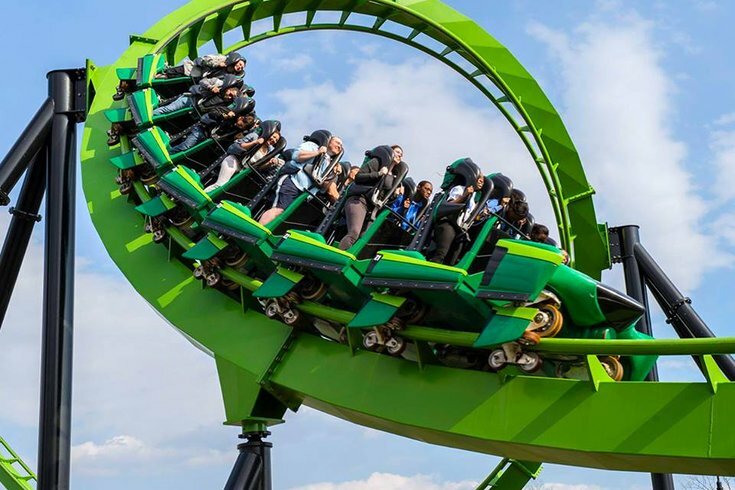 This coaster leaves the station going from 0 to 128 miles per hour in a jaw-dropping 3.5 seconds. If you're looking for something similar, but maybe not quite so insane, Storm Runner at Hersheypark will launch you from 0 to 72 mph in 2 seconds flat. Bringing the fun of a coaster indoors puts an interesting spin on the theme park favorite. Hersheypark's Laff Trakk is the first indoor, spinning, glow-coaster in the United States. The ride features glimpses of colorful characters, a dizzying hall of mirrors and more. Hidden inside a house of rock with a giant built-in skull, Skull Mountain at Six Flags takes you on twists and turns in the complete darkness. What's your favorite local roller coaster? Tell us in the comments.